It’s an indescribable feeling to be standing on a frozen lake near the Gunflint Trail and hear the howl. You know it’s a canine, though you can’t be sure if the howl you hear is coming from a team of sled dogs…or a pack of wolves. Yet, this is life along the Gunflint Trail. These types of situations crop up and the only way to experience this is to come and see, or in this case, hear it for yourself. There are many reasons to visit the Gunflint during the winter months. And climbing on the list of reasons for many people is to participate in one of the region’s most beloved traditions: dog sledding. Indeed, this means of locomotion, turned sport, turned recreationalists’ dream, is a popular activity along the Gunflint Trail and throughout the Boundary Waters region. And the sledding season is in high gear right now in January. The Gunflint Mail Run took place Jan. 5-6 right in our backyard, with the legendary John Beargrease Sled Dog Marathon right on its heels. This year’s Beargrease takes place Jan. 27-30. And while the races are for experienced mushers, they provide a perfect atmosphere for Trail life and are popular events for spectators. You can catch the sled dog race and make it back in time to relax at your cabin at Gunflint Lodge all before sundown. Meanwhile, dog sledding isn’t always about racing. In fact, most often it’s done in the form of winter entertainment in Gunflint country. 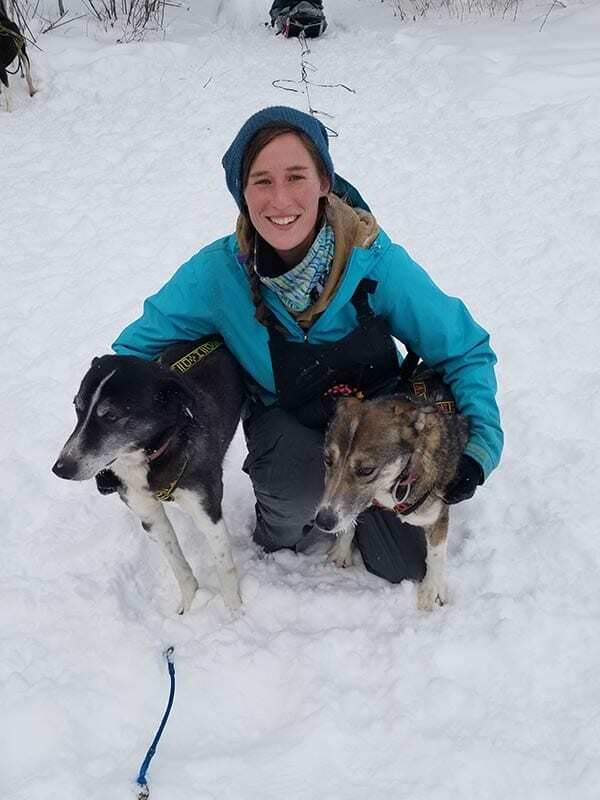 Our musher here at Gunflint Lodge, Christina DeJoseph, is an experienced dog sled driver and will guide you on an unforgettable journey. So while it’s great to watch the sled dog teams go by in the race, catching a ride with Christina takes it to the next level. For our trips, Christina stands on the sleds foot boards and directs the dogs. You ride comfortably in the cargo bed of the sled and explore the snow-covered forests from a first-class seat. In New York City people think it’s exciting to take a slow moving carriage ride through a park. In Gunflint territory, we go dog sledding through pristine forests as the full moon glows overhead. The Gunflint Trail has a rich history when it comes to sled dogs. Many of the Trail pioneers traveled with dog sled teams during the winter months, including Justine Kerfoot, the founder of Gunflint Lodge and Gunflint Northwoods Outfitters. As it goes, this Trail we call home is rich with tradition. Hopefully this winter you’ll be able to capture some of that spirit as the dogs pull your sled across the frozen border lakes and lifelong memories are created. Oh, and don’t worry… we’ll let you know if the howls are from the sled dogs or the wolves! Christina DeJoseph joins Gunflint Lodge this season as Head Musher. Christina hails from New Jersey, and is enjoying her first winter on the Gunflint Trail. Christina received her Bachelor of Arts in Kinesiology from McDaniel College in Westminster, MD, where she was a Phi Beta Kappa Scholar, Omicron Delta Kappa National Leadership Scholar, and McDaniel College Global Fellow. She is an experienced dog sled driver, with experience ranging from competitive racing to therapeutic programs. She trained across Europe and brought home a gold medal from the Hungarian Bear Cup in 2013. Her experience and enthusiasm are the perfect combination to ensure your spectacular dog sledding adventure in the beautiful Northwoods.